I love that South Africans living and working abroad come back to their “home” country to celebrate their wedding day and it was no different with Simon and Candi. Having both lived in SA but each working in different countries during the planning of their wedding, it was up to me to ensure they would have all their planning organized and 3 months to complete it. Simon is organized and we worked on spreadsheets and coloured blocks, highlighting notes and touching base at least once a week on the progress. This made planning really easy and with technology these days, planning a wedding from one country to the next is easier than anticipated. They made decisions easily and the attention for this wedding was focused on a venue which gave their guests a South African feel yet relaxed and “bush like” without having to travel far from Johannesburg. Kloofzicht lodge really suited the theme for this wedding. Candi was after the warm tones of autumn colours and chose burgundy as her signature colour. 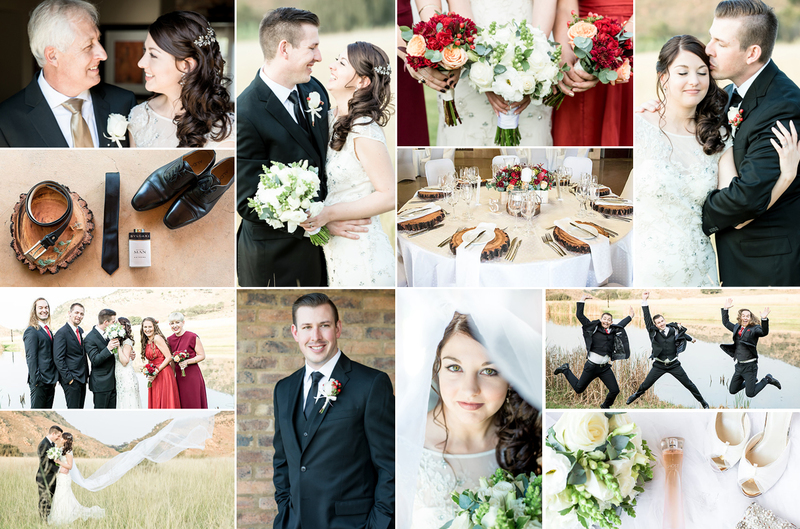 The wooden base plates and flower boxes gave an authentic appeal and the pops of oranges and reds really highlighted the Highveld winter sunset. Candi has the most incredibly calm demeanour – possibly one of the most “unstressed” brides I have ever worked with. What an elegant and beautiful women inside and out. These photographs are something special – thank you Nicolene Meyer for the most gorgeous pictures of this couple and their magical day.